Mikrogeophagus ramirezi, or what is commonly known as Ram Cichlid is a good looking small and peaceful fish. 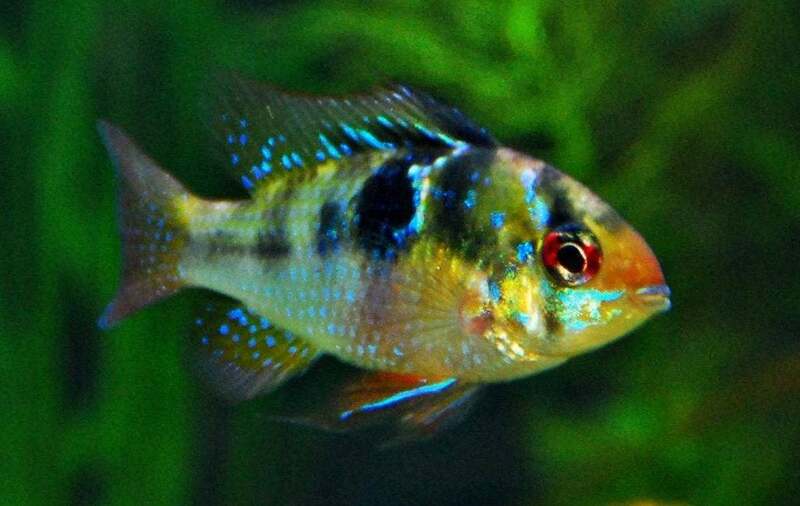 It was discovered thirty years after Bolivian Ram, which can be known as its relative but is much similar to a butterfly cichlid that is known widely and sold. These cichlids are dwarfs, yet the blue ram is much smaller in the size as compared to the Bolivian ram and its growth is just 5 cm of the total length of its body. This fish is however much larger in the wild, where it can be as long as 7 cm in length. It is commonly found in the Orinoco River basin in the Savannahs of Columbia and Venezuela in South America. 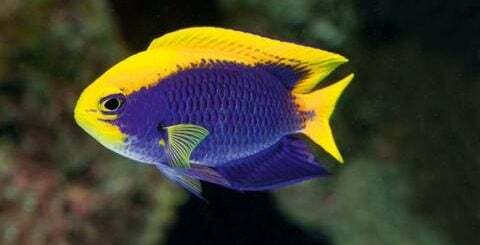 It is also quite a popular fish for the aquarium and is traded under multiple names which include, ram, blue ram, Asian ram, German blue ram, Ramirez’s dwarf child, butterfly cichlid as well as Ramirezi amongst many. These species is a member of the family of Cichlidae and the subfamily of Geophaginae. 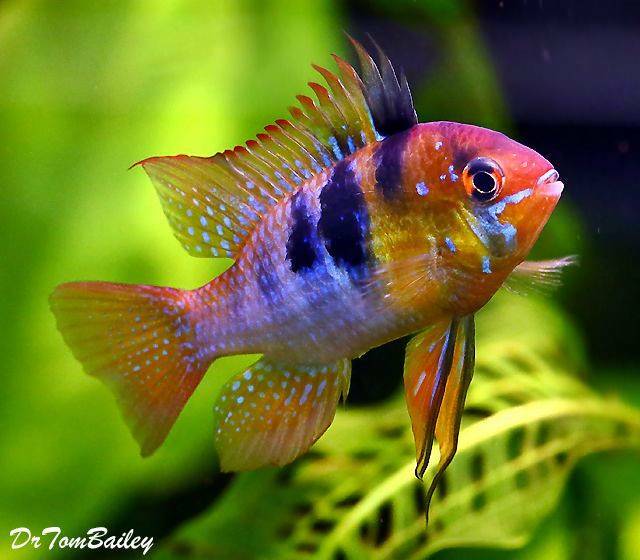 The wild Ram Cichlid is very colourful and sometimes more so than the fish which are bred in the tank. Tank fish often suffer from poor breeding and being injected from different hormones in order to enhance their colour, which also makes the males infertile. Most of the males of these fish have the first few rays of the dorsal fin extended but due to breeding, it has made some of the female fish also have this feature. When it is close to spawning, the female Ram Cichlids have a red or pink blush on their abdomens. The females also have blue sheen over the spot which is right below the dorsal fin or even a scattered blue scale on their upper half of the dark spot while the males do not have anything like this. The males may reach a maximum length of about 10 cm while the females are generally smaller. 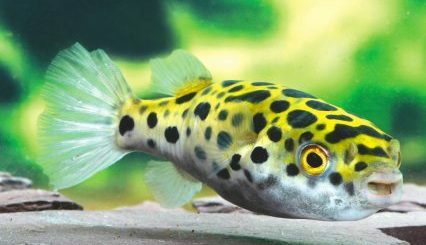 The fish has a bright and attractive colouration and has a yellow head, red eyes and a violet iridescent body with black spots and bright fins. This fish is worth seeing and keeping in the home tanks due to their different colours like electric blue, gold, albino and more. This fish is native to the Orinoco River basin and this is where it can be found in the warm waters which have quite a low mineral content. These fish prefer soft and warm to slightly hard water in the range of 78°F to 85°F temperature with a neutral pH that is between the ranges of 5.2 to 6.7. The Rams are generally found in the waters which are heavily stained with tannins as such their tanks should be populated densely and also decorated with a lot of driftwood. For decoration, floating plants can also be used which also helps to diffuse the lighting of the tank. The Rams are known to be omnivorous and they can accept a large variety of foods. 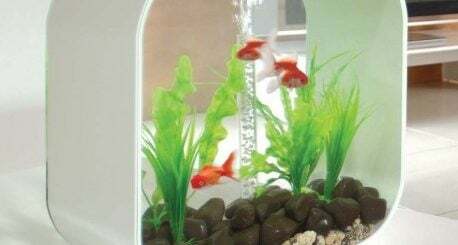 It is however recommended to feed them with freeze-dried bloodworms, ocean plankton, tubifex, cichlid pellets as well as flake food so that they are able to maintain a good diet. They have to be fed at least 2 or 3 times a day with a small amount of food. The fish is a bit shy so it is important to feed it before the more brave neighbours come around. This species of the Ram Cichlid usually breed in soft to medium hard waters and is an egg laying fish. The waters should have a neutral pH and also slightly elevated temperature. They generally lay their eggs in the caves or they spawn over flat stones. Both the male as well as the female guard their eggs and also care for their young after hatching. As such, they sometimes become aggressive and territorial when they are guarding their young ones. The eggs take about 40 hours to hatch at 29 °C (84 °F). These species form monogamous pairs as they mature sexually, and the males generally do not tolerate other males. They usually lay small sized eggs which are about 0.9-1.5 mm in size on flattened stones or sometimes even directly into small depressions which are dug in the gravel. The typical clutch size of the species is around 150 to 300 eggs even though clutch sizes of even 500 eggs have been reported for these species. They are generally compatible with other fish and can also be in a community tank along with other peaceful fish which are not very large. The good tank mates for Ram cichlids are swordtails, guppies, mollies, and plates. 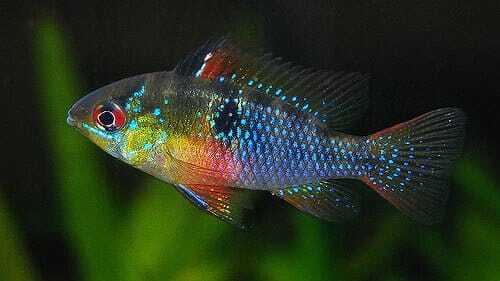 They can also easily get along with different characins such as the bloodfin tetra, black neon tetra, neon tetra, and rummy nose tetra as well. When it comes to their interaction with shrimps, the large ones will be ignored but the small shrimps will surely be treated as feed by the Ram cichlid. They can inhabit tanks as a couple as well as alone and if you plan to keep more than one couple of Ram cichlids, then your tank should be spacious enough to have covered since they like to stick to their territory like other fish. These fish are quite popular in the tropical freshwater community aquarium. 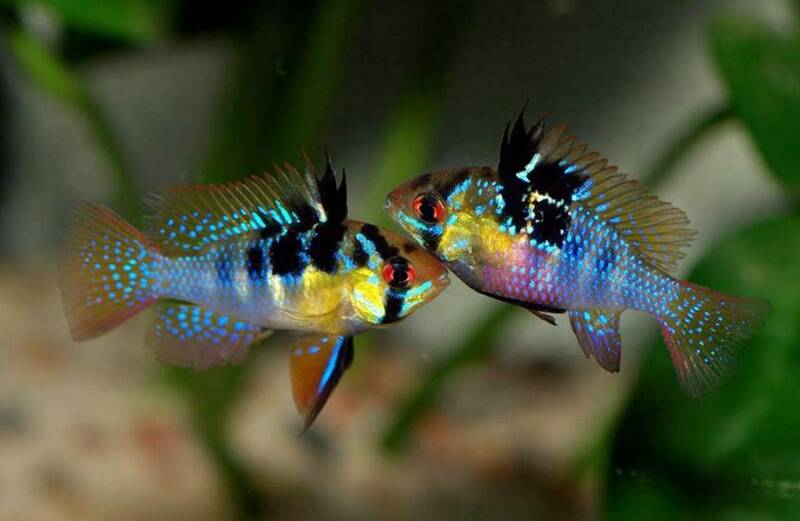 Even though the majority of the Ram cichlids are not very well suited for the community tank, if the female and the male pair of these species are placed in a community tank, they will generally do well. The recommended tank volume for them starts at 12 gallons. It prefers clean water which high content of oxygen. The water should be renewed weekly and siphonate of the bottom is very important. These fish generally stays at the bottom of the tank, which means if there are high levels of nitrate or ammonia then it is likely to affect these species. As such, the level of ammonia should be measured every week and filter can be used externally and internally. Sand and gravel can also be used in the bottom of the tank as the dwarf Ram cichlid likes digging in the sand. The decoration of the home tank can be done in the style and manner of their native river in South America with lots of sand, covers, snags, flowerpots and thick bushes. Fallen leaves of the trees can also be used on the bottom in order to create an environment which is close to the wild. The Ram cichlids do not like bright light and as such, it is advisable to have dim lights. 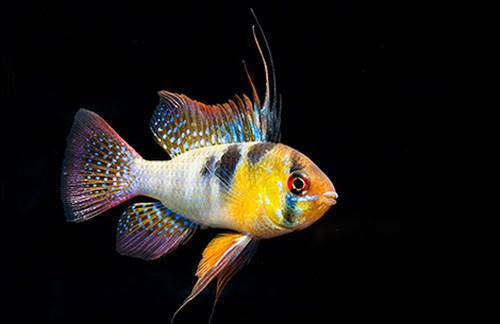 The ram cichlids have been bred in order to provide different variety of colours such as the German gold rams, electric blue rams, German blue rams, Asian rams, butterfly cichlids and more, which can be done at the home aquarium as well. The males can be distinguished easily from the females by their much brighter abdomen. The abdomens of the male Ram cichlids are either in orange colour or in red. The males are also generally larger than the females and have more of a sharpened dorsal. The natural habitat of these species is usually warm and acidic water which is found in Columbia and Venezuela. The water is also slow flowing and it contains few of the dissolved minerals and its colour ranges from clear to dark stained. The Ram cichlids are usually found where there is cover in the form of submerged or aquatic vegetation is available. There are numerous varieties of the Ram cichlids which are found and developed in Asia as a hobby for fish keeping. These include many different types of xanthistic forms which are known as the electric blue rams or the gold rams as well as the larger and high bodied, flattened balloon form varieties. Many of these varieties, however, suffer from issues like low levels of infertility, various health problems, and reduced brood care as compared to the species which are found in the wild. The ram cichlid is named after Manuel Ramirez who was one of the early collectors as well as the importer of these species for the aquarium trade. These species were described earlier by R.R Harry in 1948 and by George S Myers as the Apistogramma ramirezi and these species was then moved to and from different genera which also included Pseudogeophagus, Papiliochromis, Microgeophagus, and Pseudoapistogramma.